Pickleball is the fastest growing sport in the entire world of "aging gracefully" Baby Boomers according to Real Estate Scorecard. As a result, waterfront retirement communities throughout the continental USA have recognized this upwardly-mobile trend and are replying to the demand for this "too hot to stop" fitness craze by providing the ultimate sports playground when it comes to building health conscious retirement homes. Folks who have disconnected from the 9-5 scene thrive for a healthy, serene and all-inclusive resort-style community that not only embellishes a quality existence but a location that offers some of the finest landscaping the country has to offer. 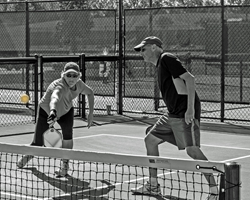 Tellico Village is just the place with comprehensive wellness amenities that include pickleball. Situated in the foothills of the Great Smoky Mountains and along the shoreline of the pristine Tellico Lake, Tellico Village continues to set the standard for living the ultimate dream during pre- and post-retirement years and has become one of the most sought-after locations for building an exquisite lakefront home in Tennessee. The Tellico Village Pickleball Club (TVPC) is highly regarded in the realm of pickleball. In fact, Tellico Village has become one of the best "places to play" on the list of the USA Pickleball Association (USAPA) spots to enjoy the sport in the United States. Members of all skill levels have the option of participating in the sport for fun and/or competing in national and international tournaments. The club here has over 450 members and is one of the top 10 clubs in the world! What is Pickleball? Pickleball is considered a paddle sport similar to a racquet game that combines the elements of badminton, tennis and ping pong. It is played with a solid paddle and a perforated polymer ball based on the same principle as a wiffle ball. The game is played on a pickleball court with volleying over a net between 2, 3 or 4 players. The game originated in 1965 by former State Representative Joel Pritchard when he and a couple friends were pursuing a friendly game of badminton. When the “shuttlecock” came up missing, Pritchard through innovation created a new game by incorporating wooden paddles from his shed, replacing the shuttlecock with a wiffle ball and lowering the badminton net by a couple of inches. Due to its popularity, The National Pickleball Championship has been featured on the CBS Sports Network. The Tellico Village Pickleball Club (TVCP) was created with a mission of promoting athleticism through the play of Pickleball and to encourage social engagement amongst the residents of Tellico Village. Not only do they offer their own in-house tournaments, they also offer on-going workshops and training for those interested in learning the sport. Today, this highly popular sport has a base of 15,000 members country-wide and is growing annually. With a membership base of over 450, the Tellico Village Pickleball Club is one of the Top 10 Pickleball Clubs in the world. It is hard to find more beautiful scenery than the landscaping that graces the immaculate lakefront homes found at the massive 5,000-acre community found at Tellico Village. Imbedded in the foothills of the majestic Great Smoky Mountains and nestled along the western shore of the 16,000-acre crystal-clear Tellico Lake, Tellico Village offers a haven for boating, fishing, swimming, and amenities that attract active Boomers to search for Loudon TN homes for sale. Active seniors not only enjoy pickleball competition and waterfront living, outdoor excursions provide yet another favorite past time for residents at Tellico Village. Staying fit is easy for outdoor enthusiasts as there are 4 preserved hiking trails built within the confines of the property. The hiking trails provide great exercise, invite exploration and fresh country air while enjoying the paradise found living in this mountain retreat. With New Year’s resolutions fresh in everyone’s minds, exploring the sport of Pickleball is a game that active folks could add to the bucket list in 2018. Plan a visit to Knoxville to discover one of the best places to retire and play pickleball. Call Tellico Village directly at 888.287.0676 to schedule a visit.